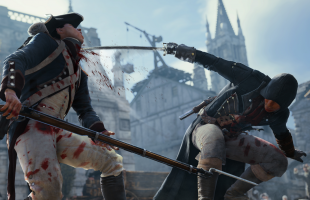 Last week I talked about why Assassin's Creed Unity doesn't make the grade as historical fiction. But with a game this sprawling and complex, there's no way I could fit even a fraction of my thoughts into a single column - I could probably write for a month on this game alone. Instead of doing that, I'm going to get it all out at once. Consider this half party, half purge. We're here to judge Unity: the good, the bad, and the dÃ©plaisant. French Revolutionaries didn't invent public execution or political violence - they inherited it. During the reign of Louis XVI the Ancien RÃ©gime still conducted public executions by hanging, drawing and quartering, and breaking on the wheel - the latter essentially a form of public torture. This was fairly consistent with other nations at the time. However, it's true that French revolutionaries had a special relationship with public violence. The Reign of Terror alone precipitated 16,594 executions by guillotine, with a further 25,000 summary executions across France. The violence simultaneously came from the top-down via revolutionary officials and from the bottom-up courtesy of crowds and armed gangs like the sans-culottes. The public nature of the bloodshed was part of the point. Violence served as rhetorical speech, carrying messages to the crowd about the virtues of correct behavior while proving the attacker's revolutionary zeal. Moreover, executions and crowd actions democratized violence, inviting passive and active participation in destroying state enemies. Every citizen, in effect, could carry out the law. 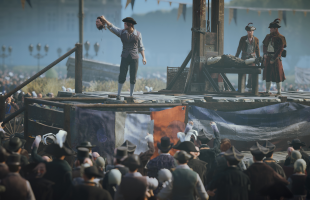 This very much comes across in Assassin's Creed: Unity. Arno serves as judge and executioner more often than not, whether it's hunting targets or punishing street gangs. And unusually for an Assassin's Creed game, the player's encouraged to engage targets in public. Whether shanking guards while blending in the crowd or fighting off criminals, you work under the eyes of the public much more than in previous titles - and in this period, that's how it should be. It's not fighting, it's communication. I'd say that Unity picked up some of Black Flag's tone, but that isn't exactly right. Swordfights in Black Flag felt brutal. By contrast, Unity's fights look elegant and light. It's Hollywood fencing, the sort seen in The Three Musketeers and similar period adventures. Arno's roguish attitude reminded me specifically of adventure novelist Rafael Sabatini's charming, fast-talking heroes. Whether knowingly or not, Unity owes a lot to Sabatini's swashbuckling French Revolution novel Scaramouche and the lasting image it created. Like Arno, Andre-Louis Moreau grows up under a godfather, raised alongside the woman he loves. Both find themselves on the opposite side of the revolution than their loves. Both dive into Revolutionary politics to avenge a murdered friend. Given that Sabatini essentially created the Hollywood pirate myth Black Flag traded on - the Errol Flynn film adaptation of his Captain Blood started the 1940s pirate boom - I'm fairly sure someone at Ubi's been reading his work. Scaramouche tells a trilling adventure story while still delving into Revolution-era abuses, and I think that's what Unity aims for. When it succeeds, it's brilliant. Unsheathing your blade to scare off bullies, dueling in front of a stained glass window and fighting off squads of soldiers feels appropriately thrilling. The Montgolfier balloon chase and its cutscene has a delicious James Bond vibe. The game's best character interactions come from Arno and Elise bantering, as any good Sabatini-style couple should. It's rough like so much in the game, but I'd love them refine the tone in the next installment. Last week I praised Unity's setting, but I never dwelled on perhaps its greatest aspect: that the street scenes deteriorate as the city plunges further into chaos. There are more barricades, more smoke, and fires in the street. It communicates in clear visual language how the Terror impacts the city. While I was disappointed that this period didn't figure more prominently in the plot - too much happens off screen for my liking - at least there was a distinct atmospheric change.